Father of Randee, Cinda and Dana. 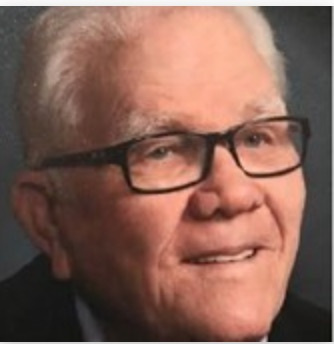 Mr. Varnie James (VJ) Shrader, 94, of Palm Desert, passed away peacefully on February 14, 2019, at home of complications due to kidney failure and cancer. He lived a grand life, capped by 63 years of marriage with his beloved wife, Jeanne. Loving, compassionate, witty, industrious and friendly to all, he believed deeply that family was everything. Born on December 18, 1924, in Dallas, he moved to Southern California with his mother and sister in the early 1930s. He graduated from Huntington Park High School before serving in the U.S. Army Air Corps during World War II with stops in Texas, Kansas, Florida and Colorado while rising to the rank of 2nd Lieutenant. When the war ended, he returned to California and attended the University of Southern California before marrying Jeanne and eventually entering the development industry building homes and apartments. A resident of Downey, Fullerton, San Clemente and then Palm Desert, VJ also had a second home in Bend, Oregon. In 1990, he joined the Board of Directors of the Ironwood Country Club and helped guide the club's growth and operations for more than two decades. He was the last living Ironwood resident who was a WWII pilot. The only things he loved more than golf were USC football and, above all, his family. He is survived by his three daughters, Randee LeBon, Cinda Churm and Dana Butler, and their husbands, David, Steve and Gary; eight grandchildren and six great grandchildren and his cat, Hank. A private memorial for family is planned. In lieu of flowers, the family is requesting donations to the of Coachella Valley or the Eisenhower Foundation Annual Fund in Palm Desert. Published in Orange County Register on Feb. 24, 2019.